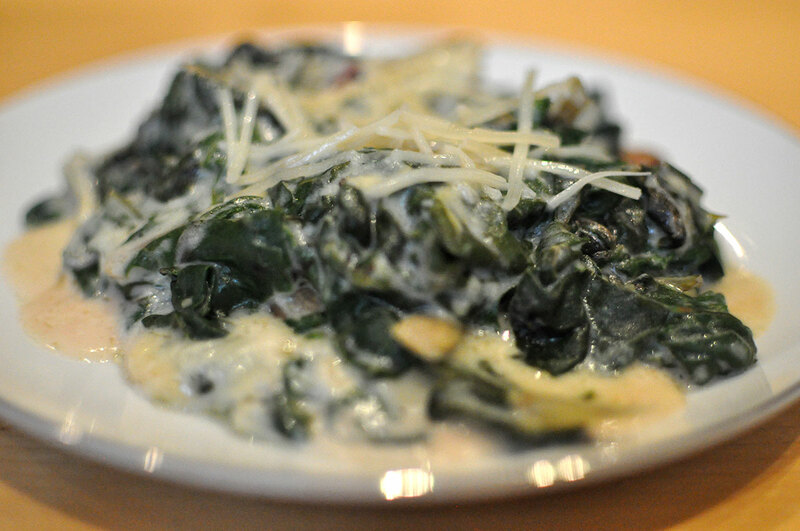 We love plain swiss chard, salve but this would be a great side dish for a holiday meal. I found this on Rachel Ray and modified it to be a bit easier, and with fewer calories by using only half of the cheese. Here is the original recipe. Preheat the oven to 375 degrees . Put chard in a large pot with some water, and steam for approximately 5 minutes, or until soft. Move to a colander to drain. When cool enough to handle, squeeze out excess water. In a large pot, melt the butter over medium heat. Add the garlic; stir until fragrant, about 30 seconds. Add the flour; whisk 1 minute. Whisking constantly, gradually add the milk. Reduce the heat to medium-low and simmer, stirring often, until the sauce thickens slightly, about 5 minutes. If you like your food with a little kick, add a dash of cayenne pepper to the sauce. Reduce the heat to low and gradually whisk in 1/2 cup Parmesan and 1/4 cup Swiss cheese. Stir in the chard; season with salt and pepper. Transfer to a 3-quart baking dish; sprinkle with the remaining cheese. Bake until bubbling and cheese melts, 15 to 20 minutes.